In the good old days before the curse of industrialisation people were more careful about avoiding waste and using every last bit of Nature's bounty. They did not have to worry about pesticides or genetically modified crops and so were much happier. For example, 'gleaners' would gather up every last grain that fell to the ground during the harvest. These extra grains might mean the difference between starving to death and just starving, whilst avoiding the over-consumption that leads to the obesity that is such a plague of modern life. 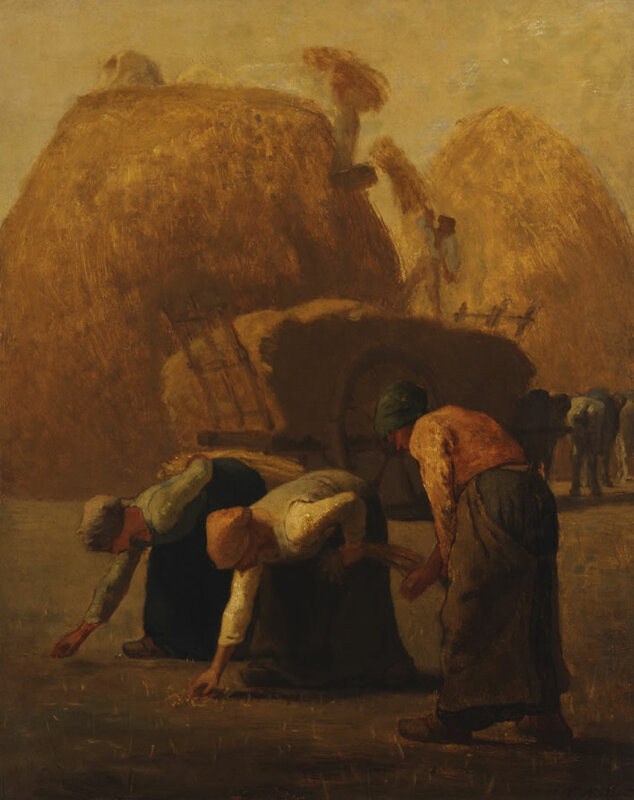 Jean-Francois Millet, The Gleaners, 1853? In the good old days before the curse of industrialisation people did not use poisons to keep down weeds in their fields. They crawled over the fields on their hands and knees picking out every last weed with their bare hands. This responsible behaviour meant that they did not have to worry about chemicals in their food. Their food probably tasted a lot better than it does now. 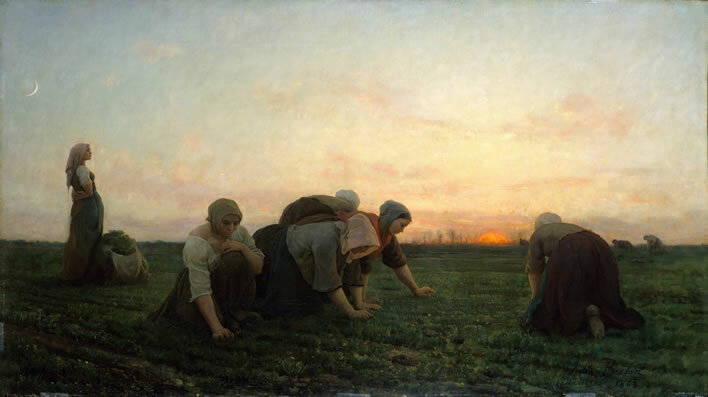 Jules Breton, The Weeders, 1868. In the good old days before the curse of industrialisation work on the land was a cheerful social activity that employed a lot of people. Villagers worked together as a community to secure their common good and as a result were much happier than people nowadays. Farmers could produce bountiful crops without needing machines that ran on fossil fuels and had huge carbon footprints with high NOx emissions. 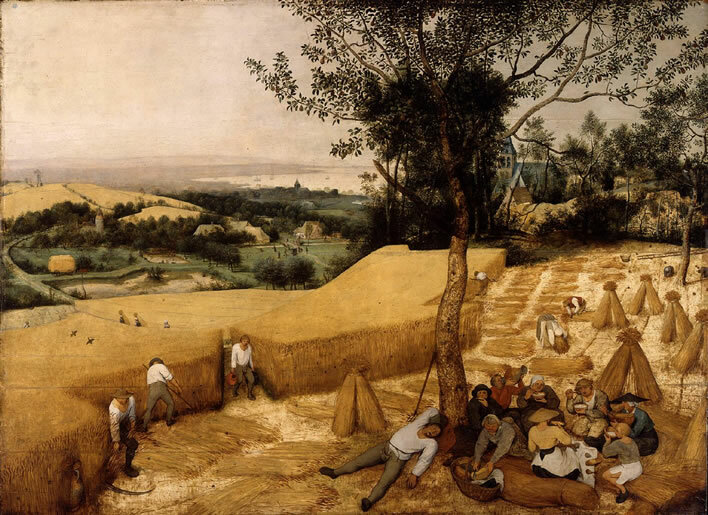 Pieter Bruegel the Elder, The Harvesters, 1565. In the good old days before the curse of industrialisation whole families worked together for their common good. 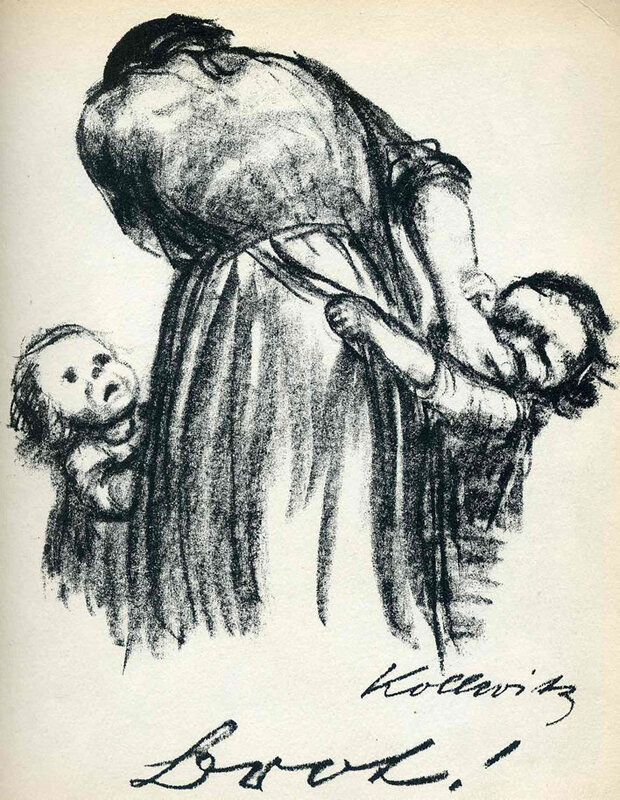 Adults had time for their children and people lived in extended families in which each generation took care of the others. They led happy family lives in the fresh, unpolluted air and wore clothing that was responsibly and sustainably sourced. 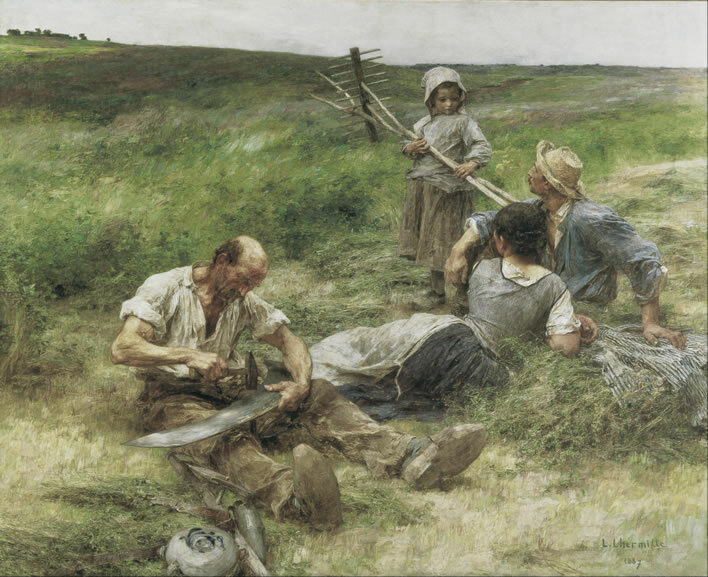 Léon Augustin Lhermitte, Haymaking, 1887. In the good old days before the curse of industrialisation people lived lives that were in tune with nature. Their dwellings were low energy buildings that had little impact on their environment. They didn't need to waste energy by squandering heat: they wore more clothes. Their clothes were made from sustainably sourced materials and they didn't waste resources on trivial fashion accessories. 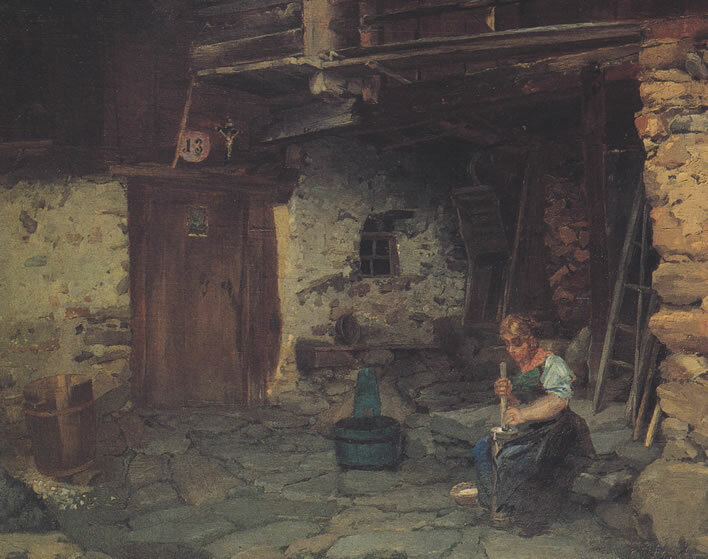 Albin Egger-Lienz, Bauernhof in Grafendorf, 1891. In the good old days before the curse of industrialisation everyone had a job. It wasn't necessary to have energy intensive machines to do things such as quarry rock. Manual labour kept them fit. They also had a noble trade that they could pass down to their children. 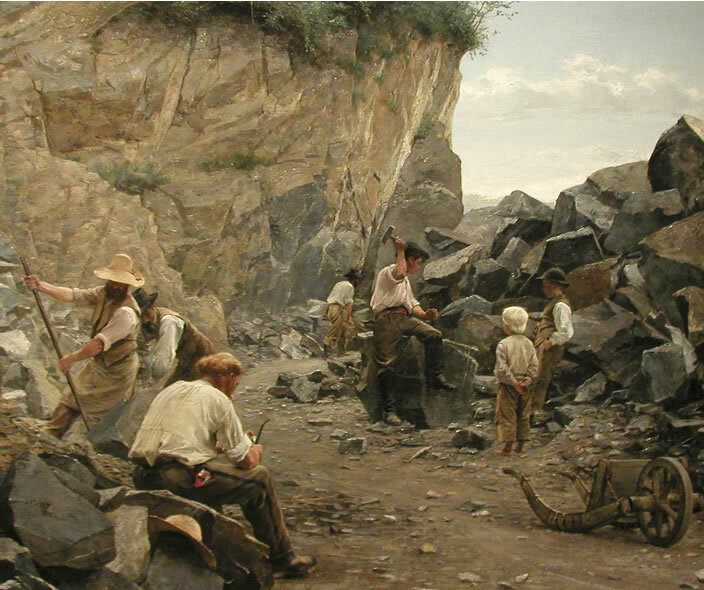 Axel Jungstedt, In the Quarry, 1886. In the good old days before the curse of industrialisation people didn't waste energy and precious water using household appliances such as washing machines and tumble driers. They didn't pollute their environment with poisonous chemicals that killed fish and wrecked the aquatic environment. They much preferred the rewarding social activity of beating their clothes on stones at the river's edge, a friendly and happy pastime which reduced feelings of social isolation by giving everyone the chance for a good gossip about life in the village. Martín Rico y Ortega, Washerwomen at the Varenne, date? In the good old days before the curse of industrialisation people were able to rely on effective, sustainable remedies that worked with Nature to cure sickness and heal wounds. There was a lot of knowledge about the wonderfully beneficial effects of plants and natural substances, knowledge which we threw away when Big Pharma captured modern minds and seized control of our lives. 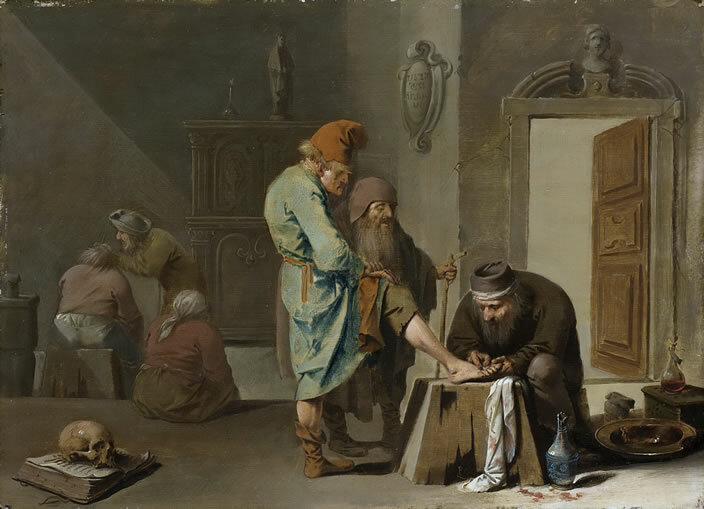 Pieter Quast, Foot Surgery, 1640? In the good old days before the curse of industrialisation people didn't need to go to a fitness studio. Because they were not spoiled by reliance on energy technology they were fitter and happier. Obesity was not a problem then. Although they only lived on average to be about 30 years old they lived happy lives of fulfilling and productive manual labour. 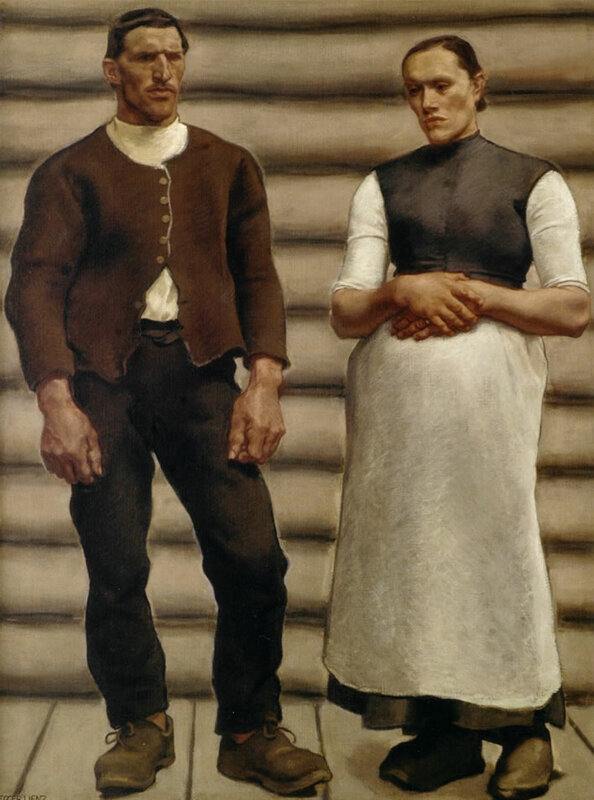 Albin Egger-Lienz, Mann und Weib, date? In the good old days before the curse of industrialisation parents had more contact with their children. They did not give them junk food, fizzy drinks or waste money buying expensive processed foods from supermarkets. Mothers would bake their own bread, for example. It was rich and nourishing rye bread, free of any additives and containing plenty of roughage. It was very popular with children. Because most children died before they reached five years old the planet was not being overpopulated in the way it is now.